Rotate the top black button on the device to quickly and easily replace the battery if the device is out of power. Just put the sensitivity adjusted button to adjust the sensitivity ( Low, Mid High) to measure the voltage ( 48V-1000V under default situation to 12V-1000V). This function is designed for voltage detection in the weak electric field. With NCV function can detect objects without any AC voltage. Otherwise, it will normally beep. 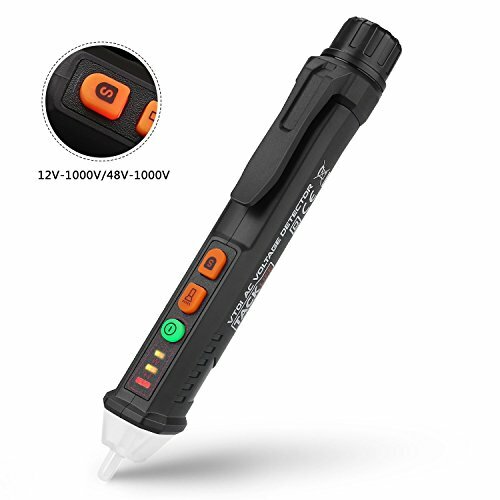 ▲ DIFFERENT VOLTAGE TEST & DUAL RANGE TESTING - Distinguish the live and null wire through different frequency alarm sound; The default ac voltage measurement range is 48-1000V, it can also measure 12-1000V by adjusting the sensitivity. Which meets the need for selecting the most suitable sensitivity before testing on different occasions and different objects .